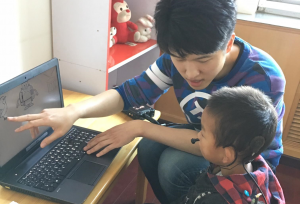 Researchers from the Child Language Lab, Dr Nan Xu Rattanasone and PhD student Ping Tang, have recently been awarded the Dr Li Sze Lim mobility scholarship for their project ‘Improving Child Hearing Health in China: Assessing Tone Acquisition by Children with Cochlear Implants’. This scholarship was made possible through a major donation by Dr Li Sze Lim who is a keen supporter of student and academic research mobility between China, Hong Kong and Australia. The project focuses on the issue of tone acquisition for children with Cochlear Implants (CI) learning Chinese Mandarin. Despite important advances in Cochlear Implant technology, children learning tonal languages, such as Chinese Mandarin continue to experience challenges in acquiring tone. This problem affects approximately 4.6 million children with profound hearing loss in China. Access to pitch information is challenging for children with CIs but is essential for learning a tone language like Mandarin, where tone is used to distinguish the meanings of words. This is compounded by complex tone change processes in connected speech. This project builds on Ping Tang’s PhD work which showed that implantation by age 2 not only provides benefits to acquiring lexical tone but, more crucially, is essential for acquiring tonal processes in connected speech. This work has won him two awards from the prestigious Boston University Conference on Language Development, including the Diversity Award and award for best student paper. The goal of this project is to identify more children who are implanted even earlier, before the age of 2, to establish their ability to comprehend and produce tones in connected speech. The scholarship will enable Ping to travel back to China to test these children, with assistance from Chinese research collaborators Professor Gao Liquan (Beijing Language and Culture) and Professor Wentao Gu (Nanjing Normal University). In China, most children are still being implanted after the age of 2. This results in poor listening and speaking skills, which may lead to social isolation and poor academic outcomes. This project is therefore extremely timely and will be the first study to provide a comprehensive investigation of the impact of early implantation on Mandarin tone in connected speech, with wide-spread implications for clinical practice in hearing health (audiology and speech pathology), clinical training, education, and hearing health policy and planning. It will benefit an enormous number of children in China alone, as well as children learning Mandarin Chinese in other countries and children speaking many of the other tonal languages around the world. This project will continue to foster strong engagements between Macquarie University researchers based at the Australian Hearing Hub and Chinese researchers.